Here’s a simple free noun game for your learners! My readers have been asking for more games for kids in grades 2-4. This has been on my list of goals for a long time, but it keeps getting pushed off. You know, raising six kids and all. But it’s important to me to continue to do “after schooling” with my big kids. Just because they’re in school doesn’t mean I want to let their teachers have all the fun! This is the first in a series of free games to teach parts of speech. 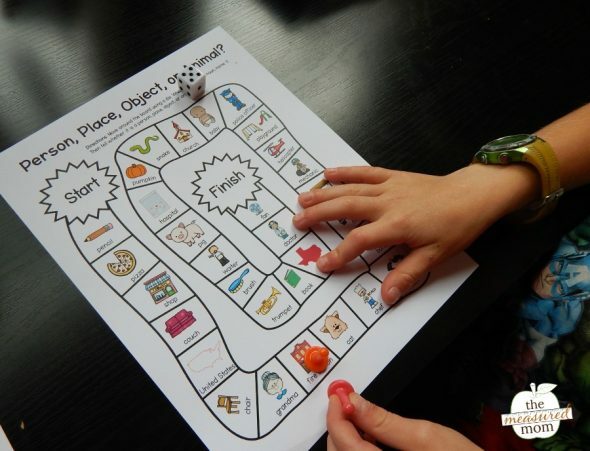 This, our first game, is a super simple noun game. Just take turns rolling the die to move around the board. When you land on a picture, name it or read the word beneath it. Then tell whether it’s a person, place, object, or animal. This was a fun and simple game for my second grader. It would also work well for first graders – and maybe even kindergartners! Don’t worry – we’ll be sharing more noun games – and not all as easy as this one. P.S. Do you prefer the old fashioned “person, place or thing?” I have a game with that title in the download as well. Stay tuned for more parts of speech games! Thank You for Sharing. I love the visual and it helps my Deaf and Hard of Hearing Students build their language foundation. 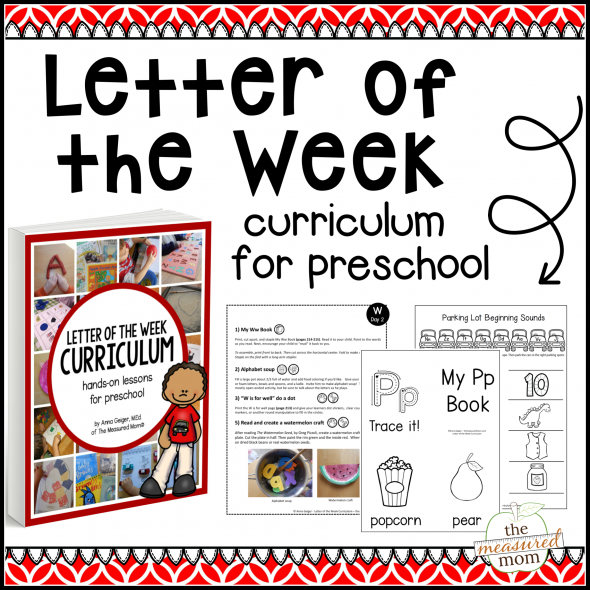 Our Preschool program refrains from using “worksheets” and more of a hands on approach. So this will be perfect in my classroom! You’re very welcome, Megan! I hope you find many helpful resources on my site. Hi, I’m so impressed with your beautiful work. Neat, clear and concise. I was wondering you you have any ideas in which to help students struggling with wird retrieval? I’d love to hear what you would recommend. Can you help me understand what you mean by “word retrieval”? 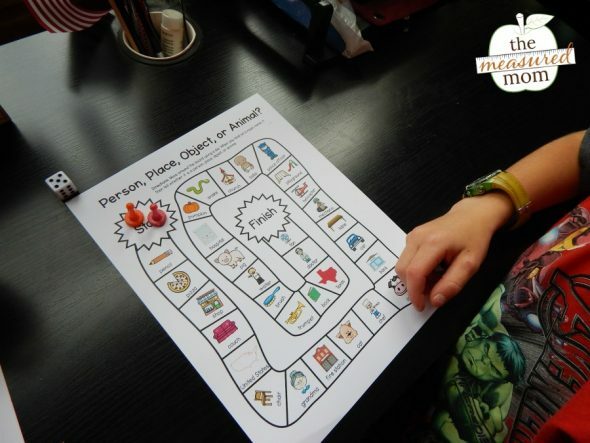 Thanks Anna for sharing this wonderful resource! I’m sure my students are gonna love the rich visual presentation. You’re very welcome, Krishna! I hope you find many helpful resources on my site. 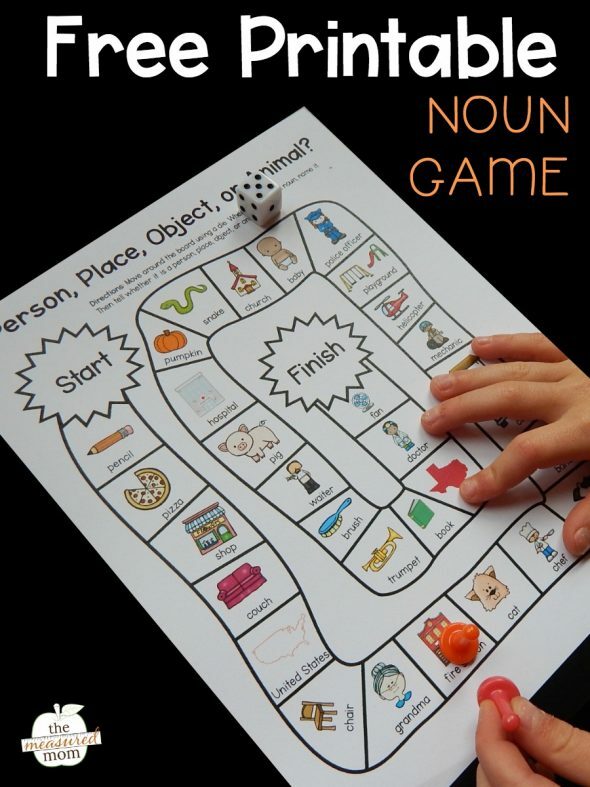 This is perfect timing, I’ve been going over nouns with my 6 year old, and I am trying to find more games to use as a reward/incentive for completing our lessons without grumbling. Thank you! You’re very welcome, Katy! I hope you find many helpful resources on my site. My Six year old has to be motivated most of the times. I have to try a lot of strategies to get him to read your printable books of CVC words and to help him develop a love for learning. Sometimes, to be honest, I sweat through the process. 🙁 Thanks for the nouns game. I would have it printed and use it for him to learn sight words as well. Thank you Anna and lots of love from Yvette. I hope he enjoys this one, Yvette! One of my kids is a reluctant learner, too – it’s hard, I know! your website is our best encyclopedia. I’m glad my resources are working for you! I am also learning a lot and really enjoying the Teaching Every Reader class. I am so glad I discovered your website and blog – my children really love your materials and it is helping to make the school year even more joyful. I’m glad you can use this, Cathy, and I’m so happy you’re enjoying the course! Someday I might bundle all my parts of speech games into a paid product – if I do that I’ll be sure to add extra games. I work with students with special needs…. great resource for them. I’m glad this works for you, Jackie! Thank you for a great quick game to have in the classroom. I love your ideas and creativity.